I hand-picked some fresh crabs last week from the nearby market and ended on making a few family favourites. the months of August and September are perfect for getting Crabs with roe at least in Kolkata. I use it quite often in my kitchen to make various dishes. A few hand-picked crabs; loads of cream, butter, and garlic, and the end result is nothing but heavenly. I am talking about the Creamy Butter Garlic Crab here at this moment. I made this dish a few days back along with the Crab Biryani. Creamy Butter Garlic Crab; Indian or Malaysian or Cantonese or Indo-Chinese? We had the Creamy Butter Garlic Crab for the first time when we were visiting Malaysia a few years back. Both I and Mehebub love the creamy texture, richness of butter and the smell of garlic together with properly cooked Crab. Pasta too loves crab and she enjoyed the Creamy Butter Garlic Crab thoroughly along with fresh garlic bread. However, the version of this dish I cooked is neither Malaysian version nor Cantonese but Indo-Chinese. I do use Turmeric powder while cleaning the crab and needless to say the gravy is subtly flavoured with turmeric. This dish calls for very basic ingredients as Crab itself is having strong flavours. Moreover, I have used fresh cream along with salted butter and loads of Garlic to make the gravy. In addition to that, I prefer slow-cooking to get the flavours just the way I like it. 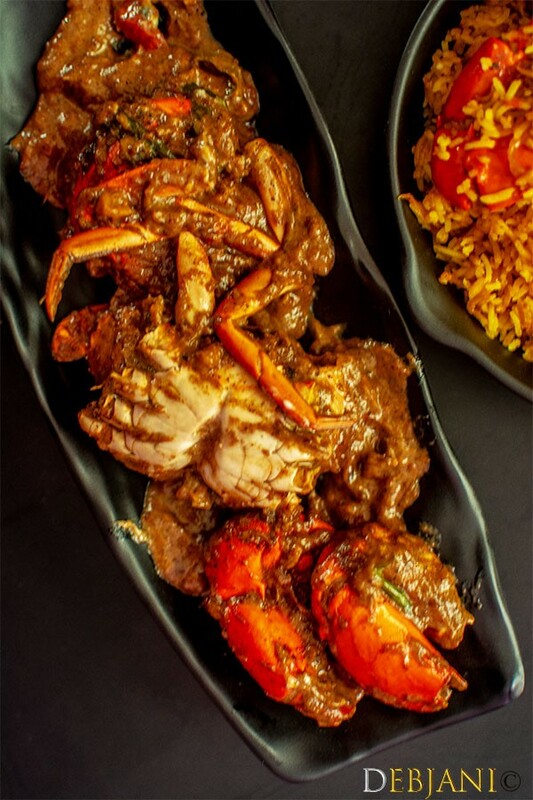 There are some dishes those are characterized by the subtle taste of the limited spices used along with the crab. 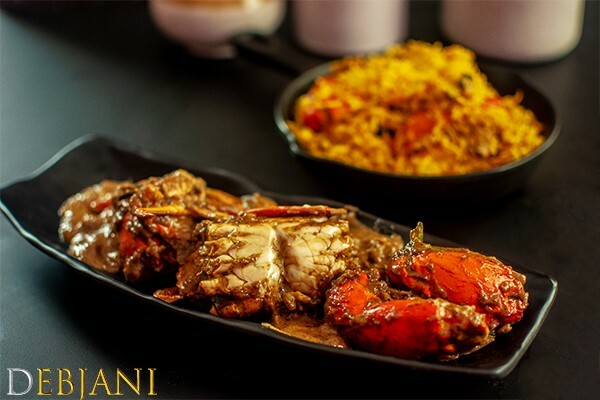 Crab, Garlic, Butter, and Cream has distinct flavours and hence it is better to not to use spices in excess. Extra spices may suppress the basic flavour. Even in restaurants, they don’t use many spices while making the Creamy Butter Garlic Crab. 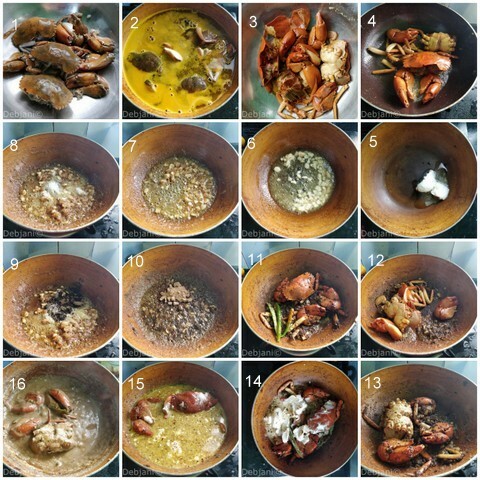 I personally use black pepper and parsley apart from salt to make this crab delicacy. Creamy Butter Garlic Crab is a famous Asian crab delicacy. Black Pepper Powder: 2 Tsp. Boil 2 litres of water and add crab along with turmeric powder and a little salt. Now cover the pot with a lid and boil for 3-4 minutes. Switch the flame off and discard the water. Now chop half of the garlic and make a paste of rest. Meanwhile heat butter in a pan. Now add chopped garlic followed by garlic paste and cook for around 2 minutes. Add Black pepper powder and salt followed by dried parsley and garlic powder, and stir occasionally. Lower the flame and add Crabs and green chilli and shallow fry for a minute. At this point add fresh cream and mix thoroughly. Now add 2 cups of Chicken Stock and cover the pan with a lid and cook over low flame for 15 minutes. Once the gravy thickens switch the flame off. Serve Creamy Butter Garlic Crab hot with Garlic bread or Garlic rice. I prefer to break the crab into body and leg for the ease of cooking and serving. Turmeric the powder is optional however it has anti-allergic properties and hence I use a pinch of it to avoid allergy. Boiling Crab with salt and turmeric powder is optional however this process is advisable to follow to avoid allergy. Both Garlic powder and parsley are optional however enhances the flavors if added. You may skip Cream and substitute it with soy milk or almond milk for a dairy-free version. You may substitute Chicken Stock with Vegetable stock or Water. I prefer to use homemade Chicken Stock. Adjust spices such as black pepper or green chili according to taste. 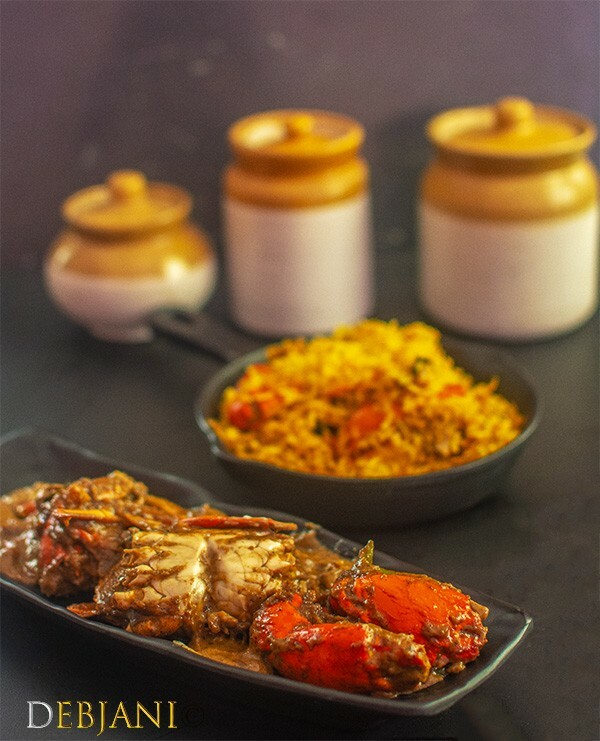 Have you tried the Crab Biryani Recipe from Debjanir Rannaghar!